The journey across Asia from Europe was, and I am sure still is, a great experience. It can be a bureaucratic and logistical nightmare but with a little preparation and care that should not put you off - the rewards are plentiful. 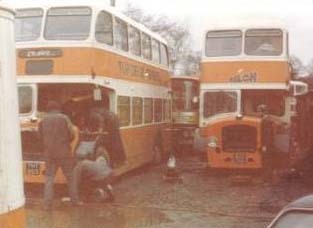 The road surfaces and conditions are quite variable but any normal, mechanically sound vehicle can do it safely – we did it in an old Bristol Lodekker double-decker bus four times! A diesel-motored vehicle is best as it guarantees access to suitable fuel just about anywhere. Your most important document is the Carnet de Passage which can be thought of as your vehicle’s passport. In most countries outside of Europe your vehicle details was entered in the driver's passport and exiting without the vehicle was forbidden or at least very difficult. Taking care that your passport is valid for more than three months and arranging visas before departure helps avoid unnecessary hassles – you don’t want to have to go through the rigmarole of renewing it and, more importantly, your visas en route. In the 1980's we normally used Dover as our departure point and travelled on the Townsend Thorensen ferries to Calais in France. Our double-deckers were not licensed to carry passengers in the UK and so to avoid problems we couriered "the punters" down from London to the ferry in a normal coach. For my first overland we had to prepare a "brand new" bus for the trip. It was a 25-year old veteran of England's rural bus service, the Bristol Lodekker. At first sight it appears the most unlikely and unsuitable type of vehicle for such an expedition but as they say "appearances can be deceiving". Whilst privacy was at a premium the bus provided a host of advantages over other more robust Expedition vehicles. With three quite discrete areas on board punters (and crew) had some choice as to how they'd spend their day. You could sleep late, laze about reading on your bunk, join in the conviviality of the lower deck or just take in the views from the upper deck. Our Deckers carried up to twenty passengers or "punters" as they were more commonly known. Upstairs there was seating for eight around two tables which could be lowered to create a large double bed, access to which was always hotly contested. Further back were banks of single bunks that accommodated twelve more. The mattresses on the four bottom bunks were larger and were preferred by those cohabitating. On the lower deck was seating for another sixteen once again around tables that doubled as beds. 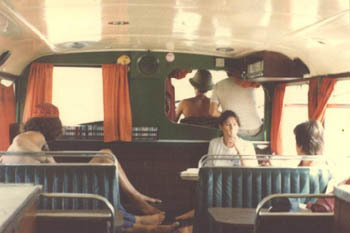 Towards the rear of the bus was the galley with a basic oven and hot plates and sink. Motivated punters could also conjure up great meals despite the basic cooking facilities and unlike on other trips individuals could prepare snacks at any time. More importantly as we ventured further into Asia the bus proved to be an oasis of calm to which you could retreat when the realities around you got too much! A week out from the departure date on that first overland our bus was still painted green in its southern county's colours and the internal fit-out was still in process. Together with the crew at the farm we began the task of transforming it into an expedition vehicle that wouldn't return to the UK for over six months. It was masked up and painted in the company's colours and its engine was overhauled. However, time was against us and only the obvious candidates for repair and maintenance were attended to. Something we would later rue. To say we were slightly under-prepared for the journey that lay ahead of us for that first crossing to Kathmandu is an under-statement. Trevor, the driver, had completed the journey once before but as a punter. As for myself, Istanbul was as far as I had journeyed. I had collected a good array of guide books and maps from Foyles' bookstore in London and most importantly gleaned what information I could from those who had done the journey before me. The bus was in worse shape that had been anticipated and Trevor worked on it with almost no sleep in the 48 hours prior to departure. I suppose that's a reasonable excuse for running out of diesel 10 miles from Dover and missing the ferry! After refuelling and bleeding the injectors he got under way again but the punters spent those hours waiting with a mixture of growing concern and impatience - not really the way to inspire confidence in our organisation and preparedness for the coming 15,000 kilometre journey! On board the ferry the driver's first duty was to purchase as much cheap whisky as could be secreted on board the bus for re-sale in foreign parts. At ₤20 a week we were not well remunerated and the proceeds of these sales were our biggest source of income. Not long after I finished my last overland, a friend and one of our more experienced drivers came undone in Pakistan off-loading these supplies and was jailed in Quetta. His story provides a fascinating account of the way corruption and privilege co-exist on the sub-continent but it's not really my story to tell. The next important commodity was carton loads of Marlboro Reds - almost currency in all parts east of Istanbul. As baksheesh they smoothed your passage through roadblocks, customs and the assorted ticklish situations that would have otherwise slowed our progress considerably. The most direct route from Calais to Istanbul takes you to Paris. On our first crossing in April of 1980 we had only just reached the motorway outside of Calais when our first mechanical breakdown occurred with the tail shaft dropping off the bus, illuminating the now wet and darkened tarmac with a spray of sparks. Trevor, now without sleep for the best part of three days, collected what parts that could be found and fastened the tail shaft into place with the remaining nuts & bolts and coast-hanger wire - repairs that were to hold fast until Istanbul. Exhausted he crawled into a bed whilst I drove through the night to Paris and gave those punters who were awake a dawn tour of the French capital. We preferred to use the Paris camp site alongside the Marne rather than the one in the Bois de Bolongne. The facilities at the Bois were inferior and at night it also doubled a pick up area for prostitutes the choice was a no-brainer. On that first Overland Iranian visas had become hard to get and we were advised to detour north to Holland. So after a day in Paris it was off to The Hague for the Iranian Embassy. We got there on a Friday left the group's passports and were told to return on the Monday for the visas. What better excuse than to motor up and enjoy the pleasures of Amsterdam? We enjoyed the opportunity to down copious quantities of Amstel beer, to ogle at all the Red Light area had to offer and some of us even took in some culture at the Reijks Museum. However on our return to the Embassy we learnt that as a result of the outbreak of the Iran-Iraq War no visas were being issued. Optimistically we replotted our course eastwards confident that things would work out. On that first Overland we cut an oblique path from Holland across Germany and into Austria to save time. It was on this leg that the first signs that something was not quite right with the bus became evident. Continuing to work on the principle that the shortest route between two places was a straight line I selected a small border crossing on the Austrian border. The customs guys raised their eyes when they saw the bus and advised us to turn around and try another crossing. As impulsive as ever we ignored the advice! It soon became apparent why we'd been given the advice; the road down the mountain looked more like it had been last used as a venue for the Luge! It plunged almost vertically down the mountain narrow and twisting all the way to the bottom. Even in first gear the bus threatened to career away from us. We reached the valley floor with brake pads red hot and the engine smoking. The old bus then gave a grunt or two before an electrical malfunction caused a small fire that filled the cabin with acrid smoke and more importantly cooking the batteries. From this point on we were forced to push start the bus and only had power when the engine was running! The punters were becoming a little disgruntled but our overly optimistic evaluation of situation calmed things down and we headed slowly towards the fun and frivolity of Camping Fusina in Venice. On a normal overland the route from Paris takes you south to the Mediterranean where we stayed in Antibes, just outside of Nice. On my third overland Iranian visas could only be obtained in India so the trip spent an extended period in the south as I flew to New Delhi and back with everyone's passports. It must have looked strange moving through the UK customs with 18 passports and only hand luggage but in those days only eyebrows were raised. The route then saw you motor across Italy to Venice (staying at the infamous Camping Fusina) before entering the Balkans. From Italy the route takes you via Zagreb in Serbia and then on to Thessaloniki and Kavala in Greece before entering Turkey. Many prefer the longer but more scenic diversion down the Dalmatian coast through Dubrovnik before crossing to Pristina in Kosovo where you pick up the main highway again. On our west-east overlands we opted for the Dalmatian coast route and locations like Split, Zadar and, of course, the walled-city of Dubrovnik were all fantastic places to explore. In summer the sparkling waters of the Adriatic are a great foil for the dry, rocky hinterland. For those with the time there are a score of islands to explore - even more enjoyable if you can afford to charter a sailing boat! It was this second longer route that we took on that first Overland. By this time the punters had become accustomed to pushing the bus to start it and even looked prepared to do this for the next 10,000 km. Their patience was was further tested when another electrical fire broke out in the cabin and only quick thinking by Trevor stopped it spreading. This time the casualty was our tape deck. However our problems with the bus took an even serious turn when negotiating the scenic but winding Dalmatian roads. Disaster always picks its moments and was it was this day. It was not long after sunset and the full moon had risen and was playing its beams across a calm Adriatic. Dinner simmering on the hot plates most of us were feeling pretty laid back and happy with ourselves. In a flash things changed; it was as if a lightning flash had illuminated the bus as every light globe surged brightly before exploding and showering the punters with glass. The headlights likewise blew and left us marooned without lights on perhaps the most dangerous section of road in Dalmatia! A single light some kilometres ahead was the only sign of habitation we could see and guided by the light of the moon we inched our way towards it aware that a fool hardy move could send us sprawling off the cliff into the Adriatic. As our luck would have it our destination was a taverna where we spent the night carousing with the locals and some young conscripts in Tito's army. On reaching Dubrovnik the next day we sent another SOS to London - send us another bus! However, even in the early eighties the area around Kosovo was affected by ethnic conflicts and these may still make this route an uncertain one. In 1981 the tension caused by the ethnic unrest in Yugoslavia was palpable but largely unreported in the western media. On my third overland traffic was stopped at a roadblock not far out of Dubrovnik and all non-local road traffic instructed to head north east to Zagreb before picking up a route either through to Bulgaria or Greece. We were reluctant to do this as once over the mountains lay a four lane freeway all the way to Pristina in Kosovo. We had left Dubrovnik in the late afternoon and as dusk came down I plotted a back roads detour to get us onto the freeway. It was an effective manoeuvre but one that was later to have almost fatal consequences. We surprised a couple of soldiers who were resting at a small roadside police post and moved through it with just a wave and plenty of accelerator. We were making excellent time on what was otherwise a completely empty freeway - a sign we cavalierly ignored. It was probably about 1 am when I was forced to stop by a blockade across the freeway and was guided into a closed and darkened services bay by some police. Not for the last time on the overland route was I to be ejected from the driver's seat at gunpoint as the bus was surrounded by thirty machine-gun wielding soldiers. The seriousness of our plight only became apparent when after the short but one-sided Mexican stand-off we were recognised as tourists and not insurgents. The clearly relieved officer then gave a command and the still night air echoed to the sound of thirty safety catches being set. We then started the long process of retracing our steps and then the mammoth detour to Zagreb which took us until early afternoon the following day. Eager to get to Turkey I opted to take the route through Bulgaria which I hoped would allow us to pick up the time we had lost. It would have if we had already had acquired visas - as it turned out we became caught in no-man's land. We had left Yugoslavia but had been denied entry to Bulgaria! After an hour or so horse trading the Yugoslavs relented and we once again retraced our steps and continued on our way to Istanbul via Thessalonki and Kavala.